The 2018 Oscars were held on Sunday, March 4. Of course, many people weren’t tuned in to hear the announcements of the Awards themselves. They were more interested in checking out their favorite celebrities in their beautiful attire. “It’s the biggest night of marketing for the jewelry and fashion industry,” explains Todd William, founder of Reputation Rhino, an online marketing and brand management company in New York City. Many female celebrities flaunted some beautiful pieces of jewelry as they walked the red carpet. Some men also rocked some great pieces of jewelry and designer watches. Altogether, the stars wore over $30 million worth of jewelry pieces at the Oscars. Here is a recap from Moti Ferder, the Design Director of Lugano Diamonds on some of the most spectacular jewelry pieces at the Oscars. Gal Gadot was the talk of the evening at the Oscars. She wore a dazzling haute-couture gown that was perfectly built for her petite body type. Virtually every fashion and celebrity magazine talked about her dress. Gadot’s dress had a necklace-like arrangement of jewels. It was covered with over 60 carats of aquamarines and over 1,000 diamonds. Emily Blunt also looked great in a beautiful, couture dress. She also wore customized cocktail earrings to go along with it. Nobody can talk about the Oscars without bringing up Emma Stone. Emma may not conform to the traditional style of Hollywood, but she boasts her own wardrobe choices well. The Oscars was no exception. Emma proudly wore a Louis Vuitton tuxedo, which accentuated her very nicely. She also wore earrings with Mandarin Garnett diamonds and an 18-karat white gold band. Emma doesn’t need any jewelry to look beautiful, but are unique earrings another jewelry pieces make her a runner up for one of the most beautiful actresses at the Oscars. The 58-year-old Allison Janney is as committed to fashion as she ever was. As she strutted the red carpet, she wore over $4 million worth of diamonds. Her 128 carats worth of Forevermark diamond stones were visible on a necklace, beautiful pair of solitaire diamond earrings and her unforgettable 18 karat ring. The stone in her ring was the largest diamond of the night. 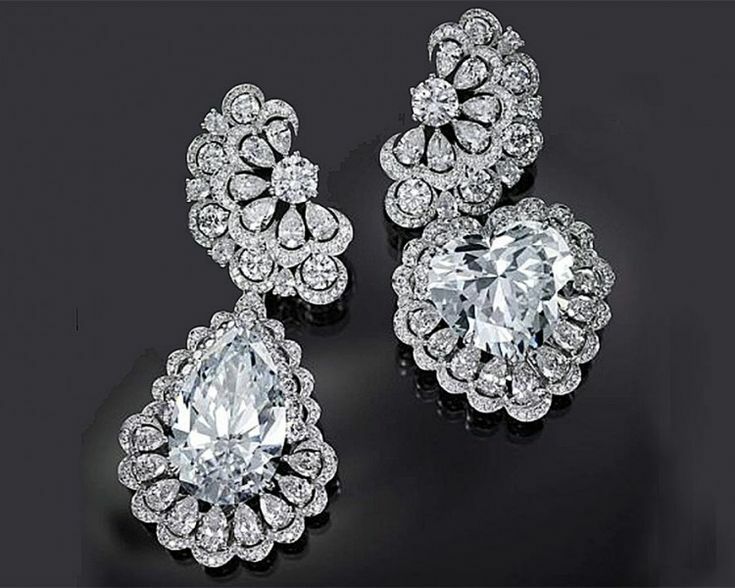 The diamonds on her earrings alone were worth over 55 carats. “Pear shaped diamonds, also known as teardrop diamonds, are a combination of round and marquise shapes with a tapered point on one end,” explains Moti Ferder. These diamonds come in a variety of slim to wide cuts and make the wearer’s fingers appear both longer and slimmer. Lugano Diamonds, recently unveiled seven new pear shape diamond creations from their extensive inventory. This year, they donned some of the most illustrious jewelry pieces the red carpet has ever seen. These celebrities will have a high bar for next year’s Academy Awards. If they want to wear even more impressive jewelry, they will need to really go the extra mile.